People say the problems with most job boards are that they are “expensive”, “complex” and “time-consuming”. These are just a couple of the adjectives HR Professionals use when describing Job Boards. The fact remains that Job Boards are one of the most effective ways to reach active job hunters. Job Boards are expensive to post on and selecting one is an impossible choice. The prices often exclude the smaller agencies who have limited budgets or tight cash flow issues. 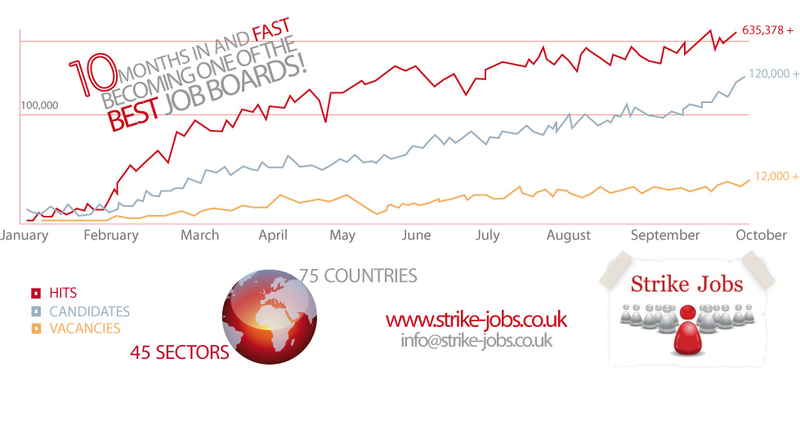 Our solution- here at strike-jobs.co.uk is to use us as and when you need. Almost like a pay-as-you go scheme. Along with a vastly reduced cost, in some cases, at a 1/3 of the price of the leading competitors, we offer a minimal price of £3-£5 per posting (agencies only rate) in comparison to the average job post of £7-£8 per posting. It’s time consuming to post the same job over and over again on all the different Job Boards so how can we help? We provide a copy and paste service for our clients so they don’t have to type them time and time again. If you post a job on another job board we copy and paste this onto our site to save you the hassle. Furthermore we have 41 integrators and aggregators which work to feed candidates to the site to get your company the maximum exposure and traffic. One of the other issues companies have it the Volume of irrelevant applications – Obviously this is bound to happen with the overload of available work hungry candidates who just “want a job” but we have put 5 screening questions with autoreject with every vacancy to strip back as many “try ME’s” as we can. Signing on with strike-jobs is “a no brainer”, not only do you get an unlimited 30-day free trial which gives everyone the opportunity to try before they buy but we focus on providing our clients a hands on service, to assist you in any troubles or queries you may have. Customer service is the key to our success. This month strike-jobs has bypassed its competitors (who have been around for up to 15 years)on Google’s site rankings, alexa.com. It shows that the daily time spent on the largest job board Reed.co.uk is 5:41minutes and the bounce rate (this being the amount of people that go on the homepage of the site and then straight off again) is 38.70%, with Job site the daily time spent on their site is 4:43 minutes, with a bounce rate of 43.70%. However with strike-jobs the daily time spent on the site 28:11 minutes, with the bounce rate being as low as 26.40%. This is evidence supporting how engaging and captivating our website really is. Most importantly strike-jobs is committed to progressive ethical and equal opportunities policies in all areas of our work and working practises ensuring that equality amongst gender, ethnicity and disability is at the forefront. In order to ensure all groups are equally represented we have the support of the current CEO of Remploy UK who will be taking on the role as Consultant Advisor on diversity and disability integration, in our effort to tackle discrimination and promote equality. With a simple and comparatively low cost service, Strike Jobs will serve all your recruitment needs for years to come, covering 45 sectors and 75 countries, and a database of 125,000 live candidates. What’s not to like? Not only do we have a website that’s innovative, simple and captivating but we ensure services are efficient, effective and offer value for money. In short, IT WORKS.